LMS WordPress Theme / LMS WordPress Plugin – a new field of WordPress is opening to the users as an LMS (Learning Management System). We are now almost familiar with WP in the online shopping cart, blogging, business site, healthcare center… but I am intending to discover this new field – WordPress theme for learning management system, eLearning, online courses, online classes today. In this post, I will try to give you overview of WordPress LMS theme and then give you a handpicked collection of best Learning Management System LMS WordPress Themes in 2019. What is LMS and LMS WordPress Theme? LMS (Learning Management System, so-called eLearning) is an advanced platform where all aspects of a learning process are being carried out. Instructional contents such as courses, lessons, quizzes… can be created, delivered and managed here. Besides that, LMS also plays a role in tracking learning progress of participants to see how far are they stepping? how are they performing training goal? From this, statistics or report will be collected for an observation. In order to join LMS, the prior registration must be done and approved. Now you have in your mind what is LMS? Then it is not difficult to understand what is LMS WordPress theme? WordPress LMS theme is a WordPress theme for making online eLearning site based on WP platform. Companies who want to set up their own internal training system. Customers who want to create free or premium online courses for sale. Create courses, curriculum, lessons, quizzes, questions and deliver these contents to WordPress interfaces. Manage settings of LMS, control learning progress of learners. Create class rosters, control over registration processes, and the ability to create waiting lists. Exchange information via communication forum. Application of LMS gamification to boost learning efficiency. What makes an Online WordPress Training Theme be the best? Excellent SEO score: your LMS WordPress theme shall be ranking on the 1st page of result search. Good UX score: high task-oriented quality, self-oriented quality and aesthetic quality of WordPress LMS theme. People heavily interacts with LMS site, a good enough User Experience is a need for any learning management system site. Great portable score: easy to use and customize. A variant of demos for easy selection and beautiful decoration. 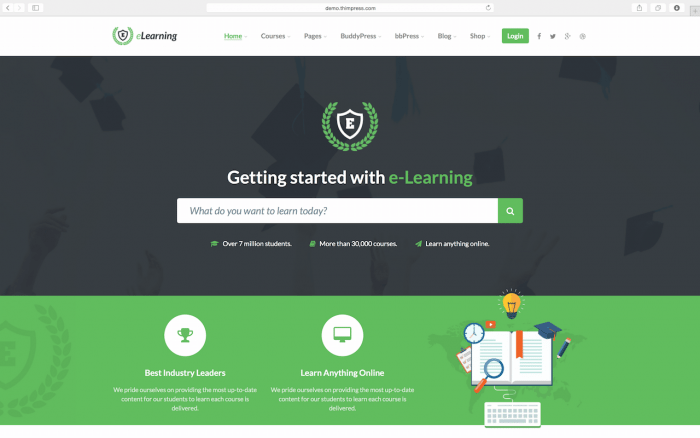 Hierarchy of eLearning WordPress theme. From above criteria, hereafter I am listing the best Learning Management System LMS WordPress Themes in 2019 according to my personal opinions which might help you find good themes without costing too much time. Kindly note that design trending is always short, even when you are reading this post, the design trending is changing, this post is an updated list of Learning Management System LMS WordPress Themes in 2019 which followed the latest design trending. We have hand-picked trending & great Learning Management System LMS WordPress Themes which published in 2019 for latest trending design quality. Hopefully, you will find one which suits your need. 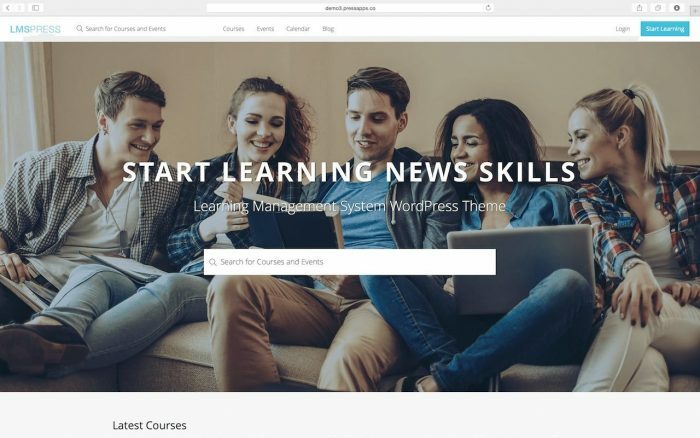 LMS WordPress theme – eLearning WP is a powerful Learning Management System to create and deliver unlimited courses, lessons…Impressively, this WP Online Course theme packs with LearnPress – a leading LMS WordPress plugin in the market by ThimPress. There are 5 types of quizzes in WordPress Online Course theme – eLearning WP: Multiple Choice, Single Choice, True/False, Fill in Blank, and Drag & Drop Sorting. The certificate is designed just by drag & drop manager upon course completion. eLearning WP also provides unlimited footers, layouts, templates, color choices which help you decorate an awesome eLearning site. Forum, blog, and timeline of Online WordPress Training theme – eLearning WP is place to clear out your stress where you can express thought, exchange information, chat with your classmates…therefore the learning process will be so much fun and joy. More than that, WordPress Course Management System theme – eLearning WP has 8 awesome demos for your selection, depending on your purpose. 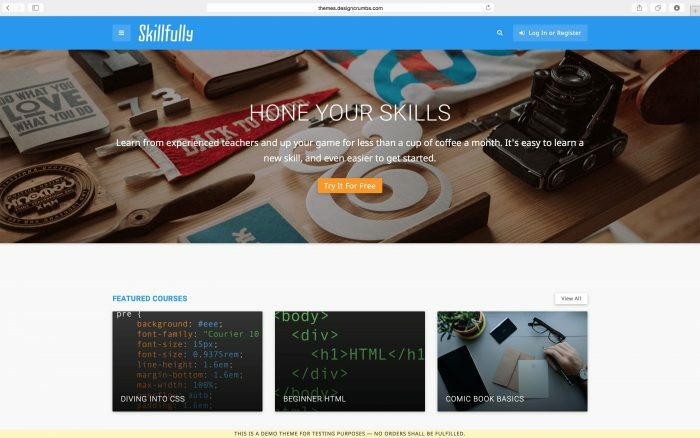 Skillfully WordPress LMS theme is an eLearning system built on WordPress platform which allows you to create a professional online marketplace of online courses, or to create an Academy of tutors. Classes can be free, premium, a subscription (with the help of extensions), or a mixture. Courses can be specially previewed! All these powerful options are designed and delivered with Google’s Material Design elements to bring your stunning modern eLearning Marketplace to life! Besides that with the help of the free Events Calendar, or the premium Events calendar Pro and WooCommerce tickets plugins from Moodern Tribe, Skillfully can display events and add as many tickets as you wish to a given event and sell those tickets entirely. Skillfully WordPress theme has a modern Material Design layout, menu & elements that synthesizes the classic principles of good design with the innovation and possibility of technology and science and provides a stunning user experience. Skillfully WordPress eLearning theme is styled for Gravity Form which is advanced forms for WordPress websites with drag & drop field placement, notification options. We put LMS Press on this list because it is also a smart Learning Management System. There are plenty of nice features in courses and lessons in LMS Press – WordPress Learning Management System theme such as: courses description, attendants count, course duration, course price, lessons count, course rating, course features, student progress, student wish list, requirements, course lessons list, social sharing, course reviews, related courses, lesson overview, lesson content, mark lesson complete, lesson reviews, related courses, post format…which help premium and free courses be easily created and controlled. Events calendar is an outstanding part of LMS Press – Online WordPress Training theme in which description, attendants count, duration, date & time, location, price, location map, programme, print tickets… are showing. You also can quickly search courses and events by Live Course & Event Search which enables fast live search in navigation and header. Besides that LMS Press – WordPress Online Course theme is built with clean code that helps you make easy modification under the hood. Similarly to eLearning WP, Varsita LMS WordPress theme is using its own Themeum LMS – a highly powerful plugin in which a lot of great e-learning features and very useful functionality can be added to your website. It supports an unlimited number of courses, lessons, assignments, students … The power and easiness of WP is used here to create a learning site about any subject. Varsita WordPress Course Management System theme is specifically built for educational institutions, training organizations and includes easy to use customization features. 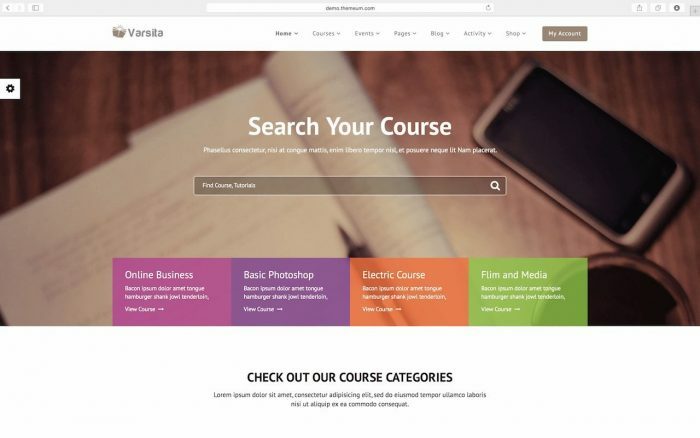 Since Varsita WordPress eLearning theme comes with advanced theme options such as header & sub-header, logo & favicon, layout & styling, slider, typography, blog & portfolio, coming soon page, footer, you will have full power to customize many aspects of the appearance of university/ school. On the other hand, you also can control a lot of useful information of learning management system with powerful LMS dashboard. The statistics on total sales, total orders, pending orders, number of courses, teachers, lessons, number of events, month chart will be available in Varsita eLearning WordPress theme for your checking. 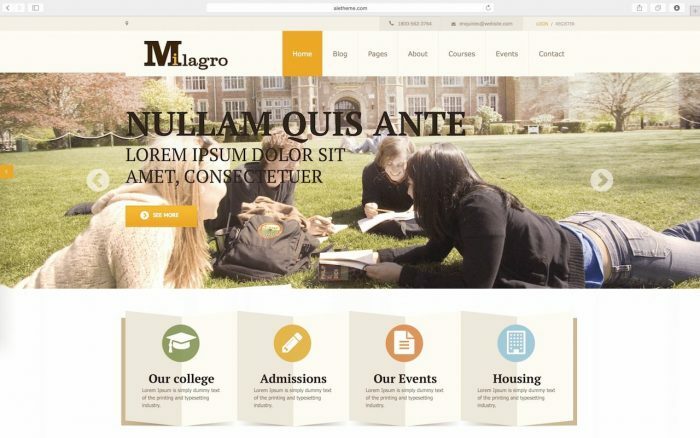 Milagro is a perfect LMS WordPress theme for Learning portals, courses agencies, e-learning sites or shops. It comes with different 6 home-page layouts, with a lot of custom options, such as unlimited color schemes, unlimited custom backgrounds, more than 600+ google fonts, tons of templates etc. Milagro WordPress LMS theme is supported by the powerful admin interface, you can easily change font, skin, color, template… you also are able to customize typography using the Typography tab in Theme options panel. Especially, Milagro eLearning WordPress theme has different separated post types such as Gallery post type, Courses post type, Testimonial post type, Members post type, Academics post type, Events post type, Departments post type, Library post type… therefore you will have a power interface for your future site. It is really a deficiency if the LevelUp is not mentioned in the list of best Learning Management System WordPress Themes. LevelUp brings you a multi-dimensional view, multi-color on courses. With easy-to-use user interface, you will simply create and manage your courses, students, and instructors, lessons & quizzes, view statistics, its trends, etc. This WordPress eLearning theme is specifically built for schools, universities, colleges, education institutes etc with the BuddyPress, Woocommerce plugin and Paypal stripe payment method integrated to sell online courses in the easiest way. Moreover, LevelUp – Learning Management System comes with advanced features such as drag & drop course curriculum, login/register forms, grid/list courses view, my account pages, Visual Composer shortcodes, font awesome, color customizations, W3C valid source codes, fully translatable, load speed optimised, cross-browser support and lots of other features waiting for you to explore. If you need more information and wanna add to your cart, please check out the below links. 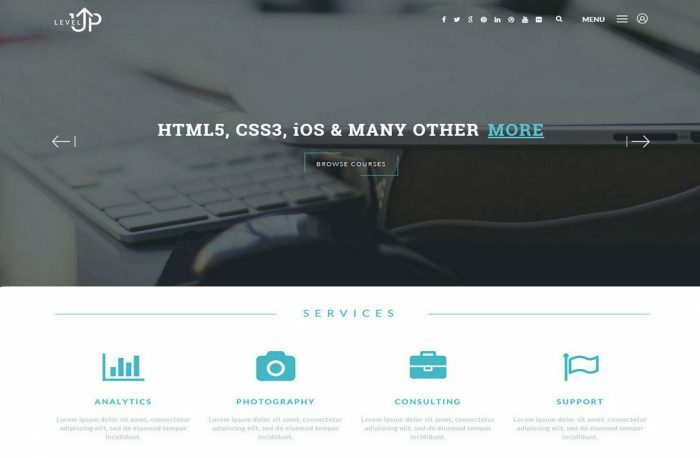 Which one is the best LMS WordPress Theme? We have managed to know what is LMS, understand essential requirements for a Learning Management System WP Theme as well as figure out a collection of best Learning Management System LMS WordPress Themes which is updated latest design trend in 2019 with details specification for each one. Now a new question is coming: Which one is the best Online WP Training Theme? It’s hard to say which is really the #1 one, but based on our detailed comparison about with some score fields, we have the winner with the highest total score, it’s eLearning WP because of its easy-to-use-interface, great UX & UI, variant demos… Anyway, looking around and see if you will fall in love with any of them. Please comment with your thought. For more the Best Premium WP themes Wparena recommend: WordPress Restaurant Theme, eCommerce WordPress Theme, WordPress Transport Theme.